This two-page PDF explains the basic features of The History List, the several different ways that individual organizations as well as a regional or national group of organizations can use The History List, and the easiest ways to log in or get a new account. The History List is the largest list of history-related events in New England and across the country. There is no cost to list your organization and events. Anyone who is signed in—staff, volunteers, interns—can enter or edit. Perfect for all-volunteer organizations. Adding information about your organization and events is copy-and-paste simple. There is virtually unlimited space for text, pictures—even video. For events that repeat, every repeating pattern imaginable is included. Publicize your summer camp or program for children. The History List publishes the only list of these programs. And unlike other sites, there is no cost to list your summer camp or program. 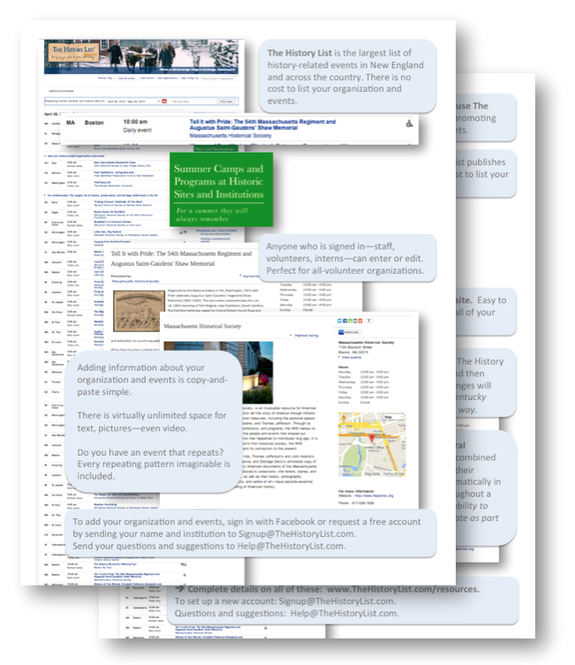 Use your organization’s page on The History List as a one-page website. Easy to set up, add and update your information as often as you’d like. And all of your events appear automatically at the bottom of your page. Manage your list of events on your website. Use the tools built into The History List to publish a list of your events on your website. Set it up once and then every time you add or edit your events on The History List, these changes will appear immediately and automatically on your own site, too. The Kentucky Historical Society is one organization that uses The History List in this way. Publish an automatically-updating calendar with events from several organizations. Use the tools built into The History List to create the combined calendar. Once it’s set up, every time an organization adds or edits their information on The History List, it will appear immediately and automatically in the combined calendar. Perfect for special events that happen throughout a community or region. The Montana Historical Society uses this capability to publish a calendar of events taking place in institutions across the state as part of the 100th anniversary of women’s suffrage in there. To add your organization and events, sign in with Facebook or request a free account by sending your name and institution to Signup@TheHistoryList.com. Send your questions and suggestions to Help@TheHistoryList.com. Download the two-page PDF with information on how to attract more visitors to your historic site, historical society, history museum, or other history organization. If your organization is having a conference or larger gathering and needs materials on attracting visitors to historic sites and history organizations, or is interested in having someone present on this topic, let us know. This handout was prepared for a meeting next week of the Western Massachusetts Historical Commission Coalition. More information on the recently formed Western Massachusetts Historical Commission Coalition is available from Elizabeth Rairigh, a Historic Preservation Planner at the Pioneer Valley Planning Commission in Springfield, Massachusetts.